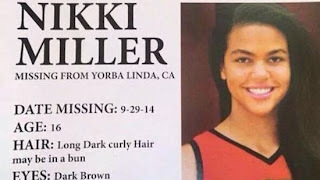 Former NBA star Reggie Miller and others are circulating a “missing child alert” for the television basketball analyst's niece, who was reported missing from her Yorba Linda home Monday. 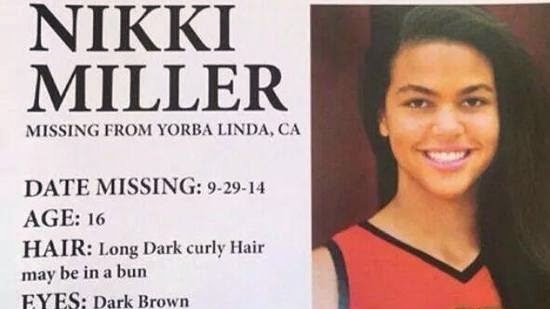 Orange County Sheriff’s Department officials said they believe the 16-year-old intentionally ran away. Lt. John Roche said investigators are not treating the case as an abduction and do not suspect foul play. The teen’s room was found empty around 7:17 a.m., when a call was placed to authorities. Investigators and officers with bloodhounds responded to the scene but found no evidence that led them to believe she was taken against her will, Roche said. “Nothing lets us believe that anything bad happened,” he said. 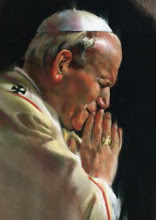 “As with most teenagers, when they get hungry or run out of money, they want to come home,” Roche said. The sheriff’s department had not yet issued an official release when Miller tweeted the alert to his nearly 600,000 followers late Monday afternoon. It described Nikki Miller as 6 feet tall and 150 pounds, with dark hair and brown eyes.